Mow your lawn one last time. Set the cutting height at two inches so the grass can store food for growth but not get so long that snow and ice will mat it down and cause problems with disease and fungus. Mulch grass clippings into your flower and shrub beds. This will help store water and protect shrub and perennial roots from heavy freeze damage. Collect the seed heads of flowers you'll want to plant in the spring. This will give you a head start on reviving a colorful and attractive flower garden the next year. Mulch or remove your leaves. Removing leaves from the yard prevents them from suffocating the grass during the winter and allows the grass to come back healthier and more quickly next season. You can mulch leaves directly into the lawn to fertilize it by shredding them with a lawn mower, or collect the excess to put in a compost pile. If you don't need mulch or compost, many municipalities collect yard waste and use it for their own composting programs. Seed the bare spots. Grass can often establish itself more rapidly during cool fall temperatures, and avoiding the summer heat also cuts down on watering time for the new sprouts. Give the lawn the nutrients it needs. Fertilize your lawn using a mix that's correct for your soil and grass. Most winterizing fertilizers are designed for grass varieties in the southern part of the country and contain higher percentages of phosphorus and potassium and lower levels of nitrogen. Take care of your weed problems. Fall is the best time apply herbicides to weeds since they are busy trying to store food in their roots. Kill the roots and you kill the whole plant. By carefully using weed killers in fall to take advantage of plant metabolism, you can use herbicide more efficiently. You'll use less, do less harm to the environment, and save more money. Avoid pruning bushes or trees in the fall. The plant is going dormant and will not be able to heal in time before ice gets into the wound and causes further damage, allowing bacteria or fungus to move in. Inspect each nearby tree and look for signs of disease or decay. Trees near a home pose potential danger to the structure itself should snowfall, wind or other extreme weather cause the tree to collapse or lose limbs. Remove any dead limbs; otherwise, a winter storm could remove a branch for you and deposit it on your roof, or in a neighbor's windshield. In the north, set out your cold weather crops in cold frames. This applies to vegetables like lettuces and broccoli that you can continue to grow even as the temperature drops. If you don't have a cold frame, you can make one by re-purposing old wooden window sashes. Clean out leaves and debris around your home's foundation. This is especially pertinent if you have shrubs planted along the walls. Keeping the foundation clear will encourage air flow and reduce the chance of moisture and mildew infiltrating your home through unseen gaps in your house's mudsill, joist band, siding or windows. It will also help prevent rot. Clear out refuse from beneath your decks and porches. Leaves and other debris can trap moisture and cause rot anywhere they have a secluded place to accumulate. Hose your air conditioner's outside condenser unit. Do not cover the unit but shield the fan housing by placing a piece of 1/2? plywood over the top fan venting and hold it in place with a couple of bricks. Dig up any tree saplings you discover growing along the walls of your house. If you don't do it now when they're small, they'll be much bigger by next fall, with deeper roots that might begin to slowly damage the home's foundation. Clean your rain gutters and downspouts and make sure they drain away from your home. Gutters should be inspected once during the fall at the very least, and if your home is surrounded by leafy trees, they should be inspected frequently until all leaves have fallen. Clogged gutters will cause excess snow and water to spill over the side and onto the ground, creating slippery patches and exposing your home's foundation to potential seepage damage. Check your soffits and gable vents for any holes that animals might crawl into. Close these up with sheet metal or 1/2? hardware cloth. Turn off the external water lines. Because water expands as it freezes, it's important that all external water lines are shut off before colder weather arrives. This means removing garden hoses from their faucets and draining them as well as the pipes themselves, and blowing out the sprinkler system if you have one. Water mains that service the outside of the home should be shut off at this time as well. 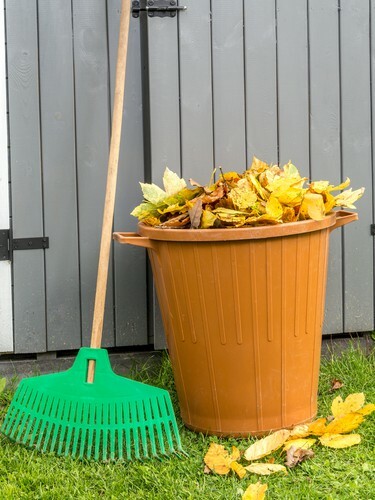 This list of fall yard work chores might seem like a lot at first glance, but many of them take just a few minutes to accomplish. If you can carve out a few hours over the weekend, you can run through your fall yard maintenance surprisingly quickly when you have a plan to follow. Not only will you prepare your yard for the long winter, you'll help prevent time-consuming, and potentially expensive, damage to your home by being proactive and knocking out your fall yardwork before the snow and ice sets in.